Rustic, vintage flooring has become a popular choice in all types of homes and decor motifs, and salvaged or reclaimed hardwood continues to capture the eye of many homeowners. But with all of the log home flooring options available, why should you buy into the reclaimed craze? The experts at Peachey Hardwood Flooring share their top five reasons to choose reclaimed hardwood flooring. Reclaimed wood is recycled wood that’s salvaged from old barns and buildings. It reduces the demand for newly harvested wood from forests and keeps old wood products out of landfills. There’s more of a story behind reclaimed boards, which makes them very unique. These boards can be sourced from various places like a historical bridge or a beautiful old barn. By using reclaimed hardwood, you’re continuing to keep the history alive for future generations. One of the benefits of aged wood is stability. Over hundreds of years, wood becomes seasoned, making it less likely to cup, twist or move significantly. Older buildings were built with only the most stable and durable timbers, which is why they’ve stood for so many years. When trees have reached their full maturity within an environment, it’s known as “old-growth.” These trees are typically stronger and larger because they took decades (possibly even centuries) to mature. The fibers in the wood become denser the more slowly the tree grows. Due to the cellular structure with old growth, their boards trap air effectively making it a great insulator. 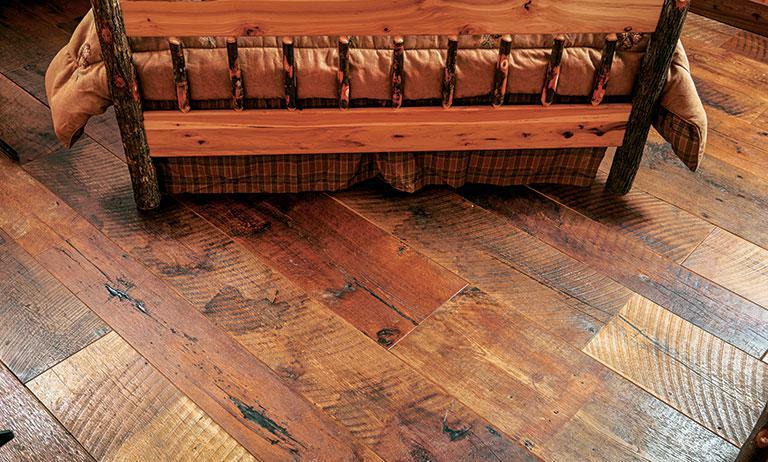 Reclaimed boards showcase various characteristics that cannot be reproduced with new flooring. Some of character marks include nail holes, worm tracks, mortise-and-tenon joints and patina that’s only possible with the aging of wood over many seasons. These characters provide a rustic appeal and offers ageless distinction and beauty. For more information about reclaimed flooring, contact the experts at Peachey Hardwood Flooring or visit PeacheyHardwoodFlooring.com.